Let’s make this year healthier! If you haven’t heard of xyltiol products then read on…. Xyiltol is a sugar produced in many natural food sources in small amounts like fruit, berries and corncobs. Our bodies are able to metabolize this sugar. Fortunately, the bacteria that cause dental cavities will recognize it as food, but will be unable to process xylitol. This causes a reduction in some harmful bacteria. Xylitol has also been shown to inhibit some bacteria’s ability to bind to our body in the nasal passages and in the mouth, even reducing the amount of plaque (soft deposits) that can form on our teeth. As an added benefit, if chewing xylitol gum, more saliva will be produced to help protect our enamel. To get the best benefit from xylitol use it consistently and often. For instance, chewing Spry gum or having a Spry mint after every meal and snack. The Spry products are sweetened with 100% Xylitol to ensure the proper amount. The flavor will only last a short time so you don’t have to worry about children chewing gum for long periods and getting into trouble in school. In fact, take a moment to let your teacher know that you are giving your child Spry gum, and why, to pass this knowledge along. 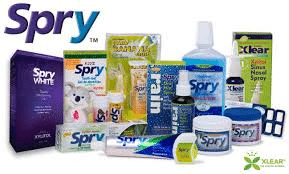 You can find Spry products at here at Healthy Smiles Dental Group and hope fully other dental offices as well. Remember that we are always here to answer questions and give advice throughout the year. You never need to wait for an appointment – call us anytime! Next Post: How to stay healthier this fall and winter: prevention is the key!